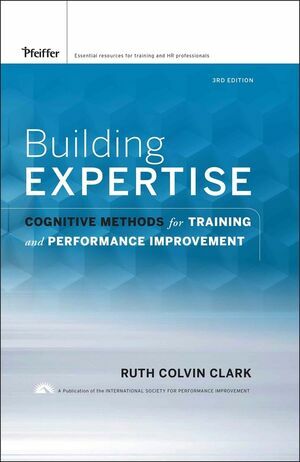 This third edition of the classic resource, Building Expertise draws on the most recent evidence on how to build innovative forms of expertise and translates that evidence into guidelines for instructional designers, course developers and facilitators, technical communicators, and other human performance professionals. Ruth Colvin Clark summarizes psychological theories concerning ways instructional methods support human learning processes. Filled with updated research and new illustrative examples, this new edition offers trainers evidence-based guidelines to help them accelerate genuine expertise within their organizations. Ruth Colvin Clark, Ed.D., a recognized specialist in instructional design and technical training, is the founder of CLARK Training & Consulting. Dr. Clark is a past president of the International Society for Performance Improvement (ISPI), a recipient of the Thomas Gilbert Award for Professional Achievement, and author of six books on instruction and learning including the best-selling e-Learning and the Science of Instruction coauthored with Dr. Richard Mayer. Introduction: Getting the Most from This Resource. PART I: FOUNDATIONS OF BUILDING EXPERTISE. Chapter 1: Expertise in the Global Economy. Seven Lessons Learned About Experts. Chapter 2: Four Ingredients of Instruction. Which Media Are Best for Learning? Chapter 3: No Yellow Brick Road. Instructional Components and Learning: No Yellow Brick Road. Graphics and Learning: A Journey Down the Yellow Brick Road. Chapter 4: The Psychology of Building Expertise. The Transformation of Content into Knowledge and Skills. PART II: BASIC LEARNING EVENTS PROVEN TO BUILD EXPERTISE. Chapter 5: How Working Memory Works. Working Memory: The Center of Learning. New Content Has a Short Self Life in Working Memory. Chess, Chunking, and Capacity Limits of Working Memory. What Happens When Working Memory Is Overloaded? Automaticity: A Working Memory Bypass. Visual and Auditory Components in Working Memory. Why Is Working Memory So Limited? Chapter 6: Managing Cognitive Load. Methods That Bypass Working Memory. Methods to Impose Content Gradually. Methods to Minimize Unproductive Mental Work. Methods to Maximize Working Memory Capacity. The High Price of Attention Failure. Instructional Methods to Support Attention. Optimizing Attentional Capacity in the Classroom. Methods to Support Selective Attention. Methods to Minimize Divided Attention. Chapter 8: Leveraging Prior Knowledge. Methods to Activate Prior Knowledge. Methods to Compensate for Limited Prior Knowledge. Avoid Activating Inappropriate Prior Knowledge. When to Use Prior Knowledge Methods. Chapter 9: Helping Learners Build Mental Models: Implicit Methods. The Building Mental Models Principle. Explicit and Implicit Encoding Methods. Implicit Methods to Build Mental Models. Graphics to Build Mental Models. Include Deep-Level Learning Agent Dialogs. Provide Examples and Encourage Their Processing. Include Process Content in Your Instruction. Offer Cognitive Support for Novice Learners. Chapter 10: Explicit Methods for Helping Learners Build Mental Models. Is Active Learning Better? A Tale of Four Lessons. Explicit vs. Implicit Methods for Building Mental Models. Incorporate Frequent Elaborative Practice Exercises. The Law of Diminishing Returns. Use Effective Questioning Techniques in the Classroom. Actively Engage Learners with Graphics. Minimize Note-Taking in Instructor-Led Presentations. Chapter 11: Learning Versus Performance: The Psychology of Transfer. Transfer: the Bridge from Training to Performance. Four Tales of Transfer Failure. Specific Versus General Theories of Transfer. Surface Versus Deep Structure and Transfer. 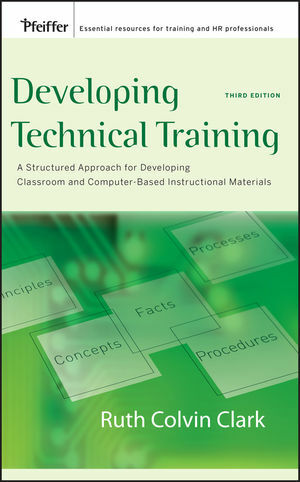 Chapter 12: Teaching for Transfer. Transfer: It’s All About Context. Learning Aids for Near-Transfer Learning. Learning Aids for Guided-Discovery simulations. PART III: PROMOTING ADAPTIVE EXPERTISE AND MOTIVATION. The Revival of Problem-Centered Learning. The Benefits of Problem-Centered Design. Model 1: Problem-Based Learning (PBL). Model 3: Sherlock and Cognitive Apprenticeship. Chapter 14: Metacognitive, Self-Regulation and Adaptive Expertise. Cognition, Metacognition, and Adaptive Expertise. Chapter 15: Motivation and Expertise. From Rewards to Beliefs: External vs. Internal Views of Motivation. Beliefs About Learning Outcomes and Persistence. Chapter 16: Motivating Your Learners. Evidence for Managing Learner Beliefs. Promote Self-Confidence by Structuring for Success. Encourage Mastery (Progress) Goal Orientations. Exploit Personal and Situational Interest. Techniques to Promote Cognitive Situational Interest. Leverage Personal Interest to Boost Motivation. PART IV: BUILDING EXPERTISE IN ACTION. Chapter 17: Practical Applications in Building Expertise. What Is an Excellent Lesson? Sample 1: A Receptive Presentation on Cognitive Load. Sample 2: A Directive e-Lesson on Excel. Sample 3: A Guided-Discovery Classroom Workshop on e-Learning Design. Exploratory Architectures for Far-Transfer Learning.